EDITION: An abridged edition of their 1974 book. PUBLISHER: Writers Club Press, an imprint of iUniverse.com, Inc.
e. Go for the Backgame? 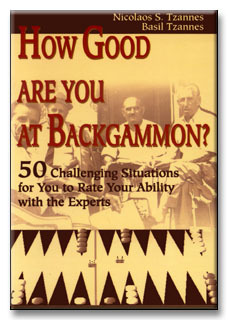 COVER: If you already play backgammon, don't you sometimes wonder how good you really are? Well this book is your chance to really find out. The 50 situations presented here cover most of the aspect of the game from initial moves to bearing off strategies. Each problem is graded on the basis of 5 poins for the optimum play and some partial credit for sub-optimum but adequate ones, if such exist. If you rack up a score of 225-250, you rank right up there with the expertsyou should think seriously of competing in Backgammon Tournaments. If you score 200-224, you are not an expert yet, but you are rapidly approaching this point. A score of 135-199 indicates that you are a good, sound player, probably the best in your ... neighborhood. If you score less than 135 points, there is no need for despair, Study this book carefully. It can serve as a case studies tool for improving your game. Besides, the problems presented are not only mind-taxing, they are also entertaining. And the justifications for the optimum play are clearly explained, often cluminating in various useful rules of thumb (the closer-closest rule, the rule of even, etc.) for difficult, but commonly occurring situations. Good luck! AUTHORS: Dr. Nicolaos S. Tzannes is a Professor Electrical Engineering at the University of Central Florida in Orlando. He has authored, co-authored or edited many engineering books in English and other languages, as well as dozens of scientific papers in his research fields of communication and Radar Systems, Signal Processing and Image Processing. Dr. Tzannes also writes non-scientific, fiction/nonfiction books under the pseudonym of Aris P. D'Avenal. Dr. B. Tzannes is a` Professor of Mathematics at the University of Patras, Greece. He has authored many scientific papers in his field of Topology. The brothers, well-known backgammon theoreticians, have also co-authored the book Backgammon Games and Strategies.